Many components of spinal stability have been studied attempting to support different treatment approaches for patients with chronic low back pain. Often a goal in rehabilitation of low back pain is to maintain spinal segments in a biomechanically neutral position during movement. Modulation of intra-abdominal pressure optimizes this bracing mechanism promoting synergistic activity of trunk stabilizers and limb movements. 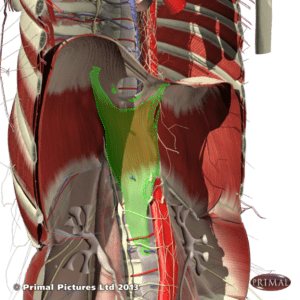 The diaphragm muscle, along with local lumbar stabilizers and the pelvic floor, may play an important role in modulating intra-abdominal pressure, especially during postural tasks.1 Therefore, dysfunction of this muscle could be expected in patients with chronic low back pain. The aim of this study was to assess diaphragm excursion and recruitment in a control group and in patients with low back pain. Twenty-nine healthy subjects and eighteen patients with chronic low back pain were recruited. Dynamic MRI and spirometry were tested while patients performed normal tidal (resting) breathing and again with isometric limb contractions of the upper and lower extremities. The results of the study showed no significant difference in diaphragm position when tested at rest. However, significant reduction of diaphragm excursion was observed while performing both resisted upper and lower extremity contraction in the group of patients with chronic low back pain compared to the control group. Additionally, a more cranial position of the diaphragm during inspiration was noted in the patient group during performance of both resisted upper and lower extremity contraction. Cranial position of the diaphragm was more evident for the posterior-cranial (crural or lumbar) portion of the diaphragm, demonstrating a steeper angle in relationship to the most ventral-medial position of this muscle, in contrast with the more symmetric recruitment observed in the control group (Figure 1, A and B). It is postulated that this asymmetry could increase anterior shear forces on the ventral region of the spinal column, thus exacerbating the symptomatology of chronic low back pain. Figure 1. Diaphragm anatomy. According to the result of the study, the more posterior cranial portion of the diaphragm (lumbar or crural portion – here in green) presented a more cranial position in respect to the ventral portion in the patient group. A) Illustration, B) Anatomical section. A high correlation was also noted between total diaphragmatic excursion and maximum expiratory pressure when lower extremities were engaged, possibly reflecting that respiratory muscles other than the diaphragm were more consistently recruited during tidal breathing, whereas the diaphragm was more central to breathing in healthy subjects. Besides that, normal spirometric function was noted in both groups, supporting the hypothesis of a compensatory mechanism accomplished by accessory respiratory muscles. Figure 2. Patient lies supine on a comfortable surface. If desired, position the trunk at a 30° inclination, as evidence shows abdominal excursion increases in this position.5 A thick pillow under the knees can make this position more comfortable. Figure 3. Patient places one hand on the upper abdomen and the other hand on the chest. Then, slowly breathes in through the nose and breathes out through the mouth. With inhalation, abdominal breathing is encouraged (movement of abdominal hand), attempting to keep rib cage movement to a minimum. 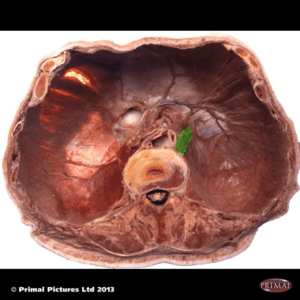 During exhalation, the abdomen should “deflate”. By performing a pursed-lips strategy during exhalation, a retrograde pressure in the upper airway is created, thus promoting emptying of the lungs, and thereby enhancing the subsequent diaphragm activation. Figure 4. Once appropriate control of diaphragmatic activation can be achieved, the exercise is progressed by incorporating upper or lower extremity movement along with diaphragm contraction to facilitate a stabilization strategy. Figure 5. As the patient improves, more complex activities can be incorporated. It might be important to include movements that were observed to be deficient in the initial basic functional examination. For example, if the patient demonstrates a deficient movement pattern during squat, the therapist can advise the patient to breathe in using the aforementioned diaphragmatic stimulation technique (thus improving spinal stability), then squat down while slowly breathing out with pursed lips, breathe in again and straighten the legs while breathing out with pursed lips. Eventually, an opposite pattern in which patient first breathes out with pursed lips and then breathes in with diaphragmatic stimulation while squatting down and straightening up can be used when the patient demonstrates a more efficient movement pattern acquisition. Hodges P, Kaigle Holm A, Holm S, Ekström L, Cresswell A, Hansson T, Thorstensson A. Intervertebral stiffness of the spine is increased by evoked contraction of transversus abdominis and the diaphragm: in vivo porcine studies. Spine. 2003 Dec 1; 28(23):2594-601. Hodges PW, Butler JE, McKenzie DK, Gandevia SC. Contraction of the human diaphragm during rapid postural adjustments. J Physiol. 1997 Dec 1; 505 ( Pt 2):539-48. Enright SJ, Unnithan VB, Heward C, Withnall L, Davies DH. Effect of high-intensity inspiratory muscle training on lung volumes, diaphragm thickness, and exercise capacity in subjects who are healthy. Phys Ther. 2006 Mar;86(3):345-54. Parreira VF, Coelho EM, Tomich GM, Alvim AMA, Sampaio RF, Britto RR. Avaliação do volume corrente e da configuração toraco- abdominal durante o uso de espirômetros de incentivo a volume e a fluxo, em sujeitos saudáveis: influência da posição corporal. Rev Bras Fisioter. 2004; 8: 45-51. Hodges PW, Butler JE, McKenzie DK, Gandevia SC. Contraction of the human diaphragm during rapid postural adjustments. J Physiol. 1997; 505 pt 2:539-548. Hodges PW, Butler JE, McKenzie DK, Gandevia SC. Contraction of the human diaphragm during rapid postural adjustments. J Physiol. 1997 Dec 1; 505( Pt 2):539-48.